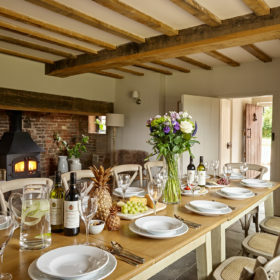 Bring together family and friends at Orchard Farmhouse, a lovingly restored hunting lodge in the heart of Shakespeare country. 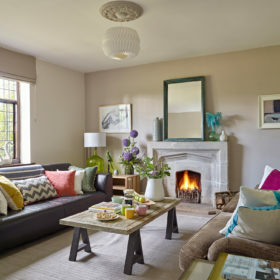 You’ll all be drawn to the media room, the games room, the vast acreages and adventure playground outside, the crackling logs in the living room, and the honey-stoned beauty of the Cotswolds. 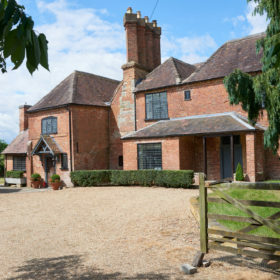 Orchard Farmhouse is all things to all men, and all ladies, too. 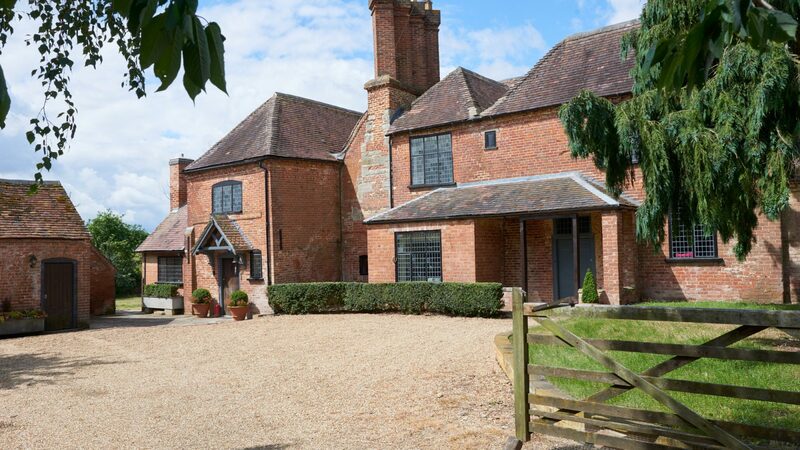 It’s a former hunting lodge turned into a fantastic family holiday home. 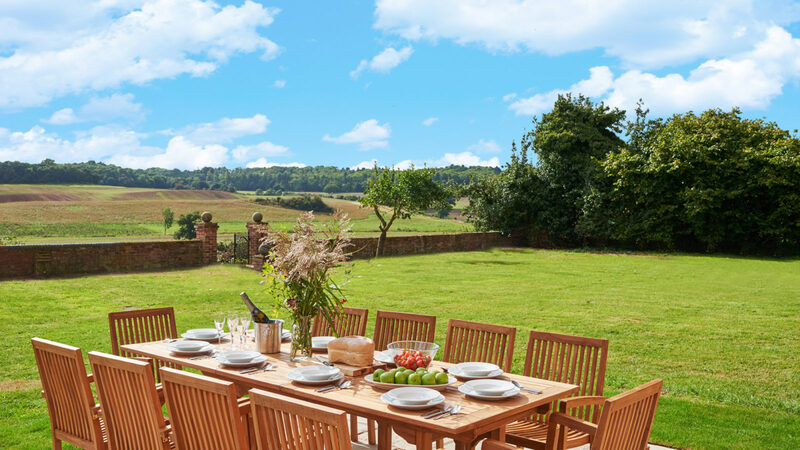 A place for a get-together – and to get-away. 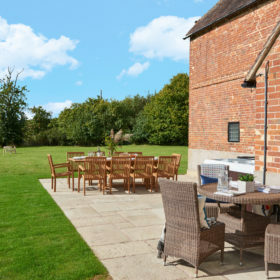 It’s a right royal good time just minutes from Stratford-upon-Avon, on the edge of the gorgeous villages and valleys of the Cotswolds. 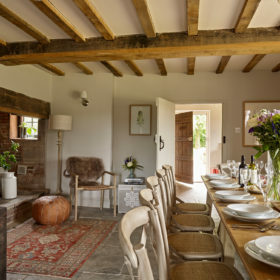 Sleeping 16 in seven bedrooms, and accommodating a similar number around an elegant dining table, Orchard Farmhouse has bells and whistles right up to its oak-beamed ceilings. Behind its mullioned magnificence lie all manner of mod cons, designer touches and bags of style. Relaxation is easy here. You can grab some in the media room with 48” Sky TV or in the games room with TV, pool table and table football. And it’s available in spades in the living room, where the sofas are big and squishy, the logs crackle and the happy chatter is always aflame. 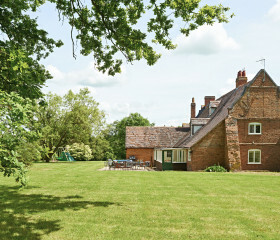 Outside, the house has pinched two-and-a-half acres of rolling countryside, which it’s dressed in its party best. 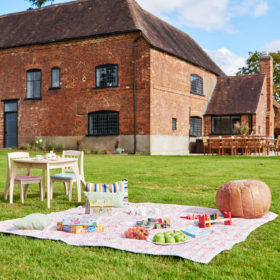 Lovely lawns are neatly ironed, shrub beds have been casually added, and there’s some nice accessorising with an orchard and kids’ adventure playground. 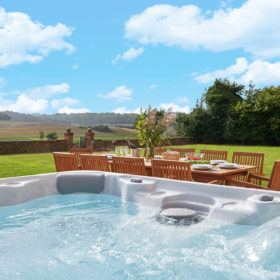 Oh, and a hot tub. It’s all decidedly delicious. The grand sweep of the entrance gives way to gravel suitable for eight cars to park on with a satisfyingly rich crunch. 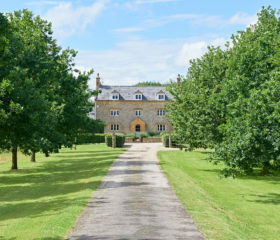 There are two-and-a-half acres here of the English rural dream, with the bucolic silence pierced only by the call of wild birds and the rustling leaves in the breeze. Pour yourself a Pimm’s and play some cricket or croquet on the lawn. For winter games, there’s a football to find. Or just head out for a picnic. 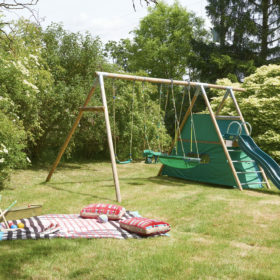 The meadow seems to roll forever; the ancient orchard is perfect for hide and seek; somewhere out there, there’s an adventure playground for the kids. Fire up the gas barbie and sizzle some steak, sit out under the stars with a long drink, lounge around in the hot tub. Time isn’t measured in hours and minutes here, but by the moments you spend with the people who matter. 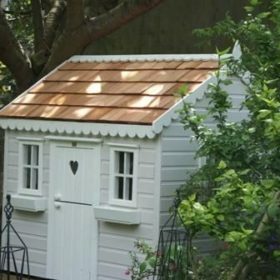 There’s space here to live royally, to escape, to entertain or be entertained, to be sociable or just be you. 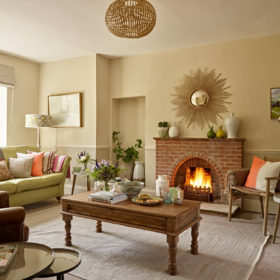 With the logs blazing in the living room, and nibbles and drinks on the coffee table, the scene is set for the evening. Chat, laugh, play games, reminisce, stay up way past bedtime. There are no school nights here. The flames crackle in the drawing room, too. 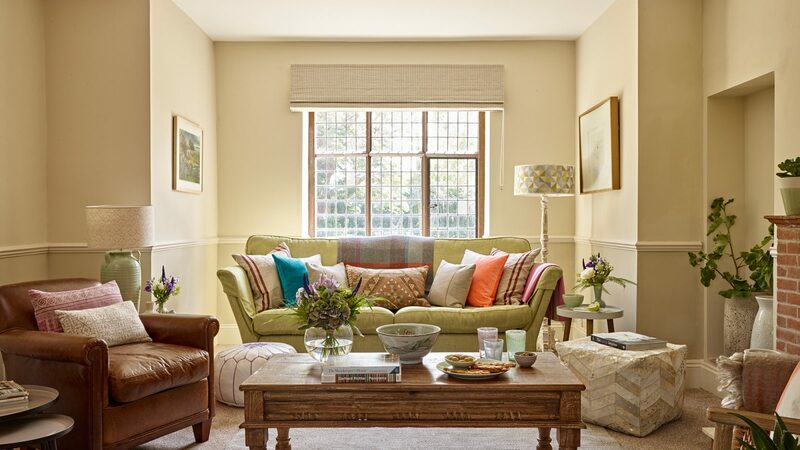 It’s somewhere to escape among the homely throws and comfy cushions. 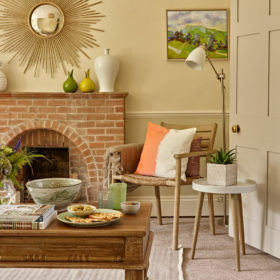 Grab a cup of coffee and a pack of biscuits and lose yourself in a book or magazine. If the mob appears, there’s always the snug. For the big match or big movie nights, head to the media room for Sky on a large-screen telly. Want the other channel? Try the games room for a film on Freesat. While you’re there, knock a few pool balls around or flip some wooden footballers on the table footie game. Dock your iPod for some sounds, dig out the toys, books and DVDs for the kids, tap into the wifi that buzzes throughout. 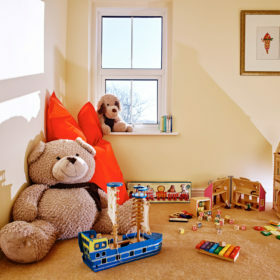 The living spaces at Orchard Farmhouse are big, beautiful and brimming with toys and trinkets. Settle back, zone in to the atmosphere and switch off. 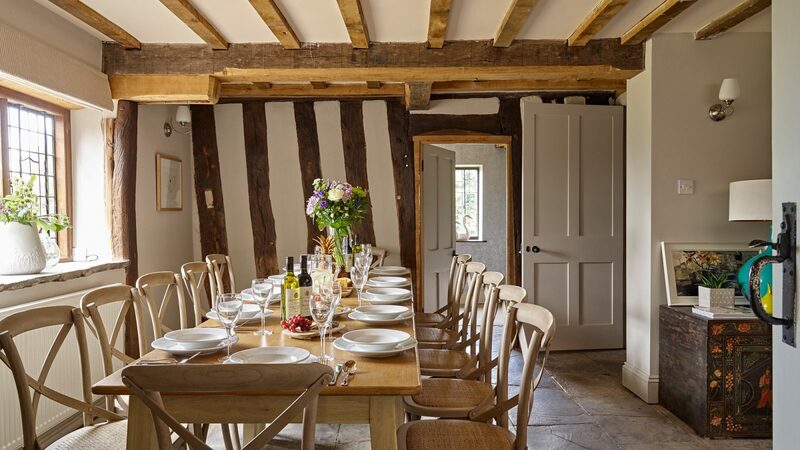 The dining room’s all flagstone floors underfoot and oak beams overhead. The chunky oak table’s laden with goodies and the pitcher’s ready to pour. Light the candles, butter the bread and pass the salad bowl. 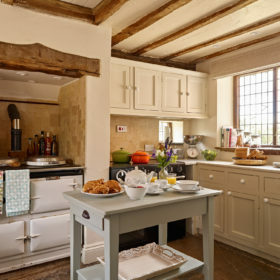 In the engine room, there’s an Aga, range and microwave. Pile up the dishwashers when you’re done. 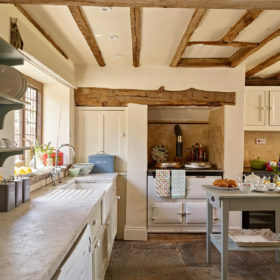 You’ll love the country-chic kitchen, with its olde-worlde beams, plate racks and flagged floor, but you might prefer to call in the pros. 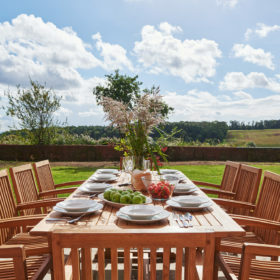 From an intimate meal for two to a special-occasion supper for 16, our chefs will forage for the freshest local ingredients and prepare something lip-smackingly lovely. For a change of scene, head to Alcester to The Roebuck for delicious cuisine infused with local organic ingredients, such as medallions of fillet beef with black pudding and Cognac cream. Or how about home-made steak burger with bacon at The Broom Tavern, an old drinking haunt of The Bard? Speaking of Shakespeare, if you fancy a bite to eat before the curtain rises, there’s a light lunch on offer at the HR Coffee Bar, or scoot into 33 The Scullery for pan-fried guinea fowl with honey and tarragon or chunky Barnsley chop. 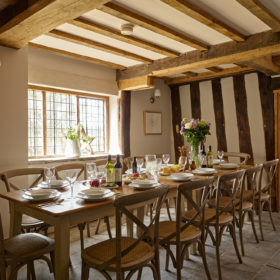 For that Michelin-starred experience with a French flavour, try The Dining Room at Mallory Court. 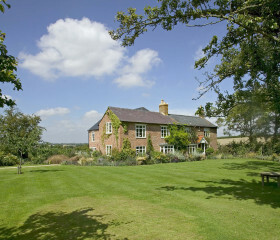 Orchard Farmhouse sleeps 16 in oak-beamed, deep-mattressed splendour. 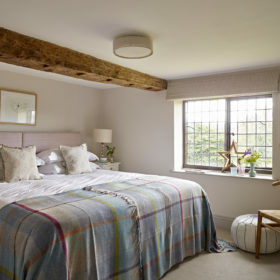 Cotton sheets are soft and luxurious, duvets downy and delightful, and the heavy-hewn oak doors add a touch of rustic chic. There are seven bedrooms here with plenty of flexibility built-in, with 14 accommodated in superking beds that flip to singles through the miracle of zip-and-link. Two further single beds complete the line-up. 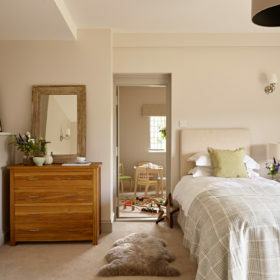 Each bedroom is as beautiful, spacious and tasteful as the last. Three come with en-suite shower rooms and there’s a family bathroom with shower and bath and spare WC with handbasin. 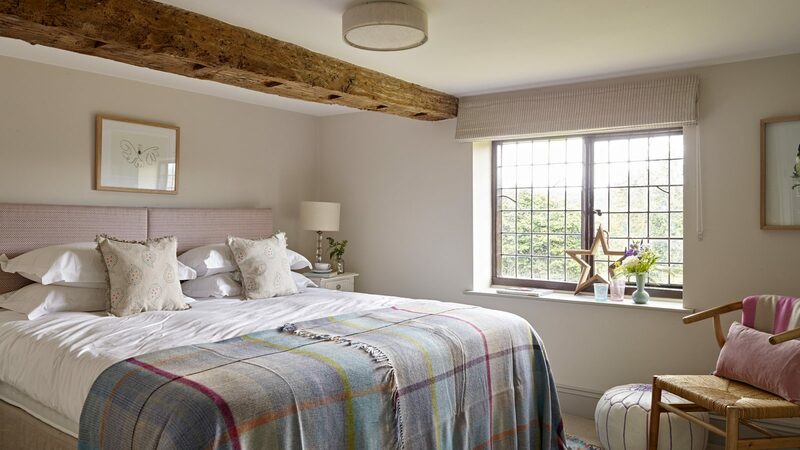 Choose any room and enjoy meadow views through the mullioned windows, serene silence and delicious dreams. Gone are the days when the only way to view a house was solely by way of pouring over flat and sometimes confusing floor plans. 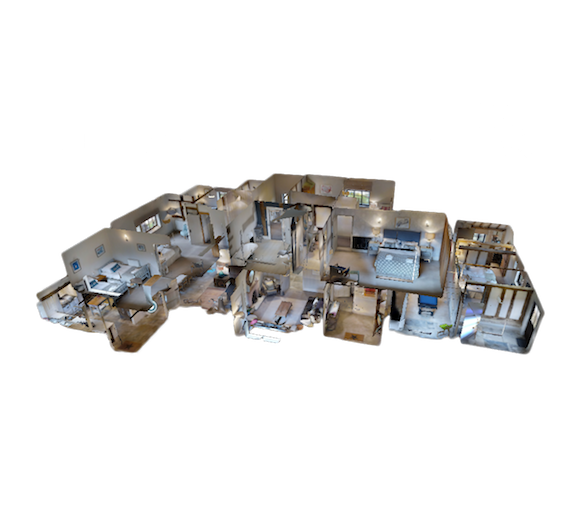 With the emergence of 360-degree video we have an exciting new way of being introduced to the layout of a house. For kids, holidays get locked in their memory banks forever. 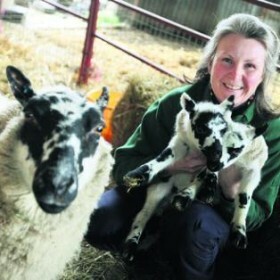 They’re a change of scene, a chance to go free-range in a new world of undiluted liberty. 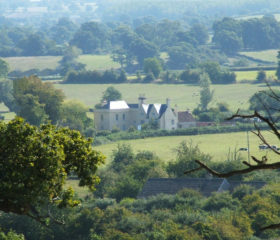 Orchard Farmhouse provides the canvas to explore those possibilities, with its unending acres and rambling meadows. With those endless acres of wild rural beauty to explore, hide-and-seek can take some time here. 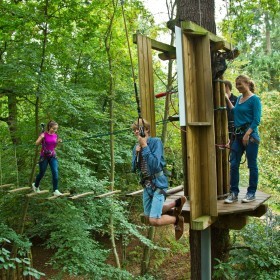 Games can also come to a premature end once the adventure playground takes over. Not enough of a distraction? Try digging out the footballs, or the croquet mallets and cricket bats. Inside, wifi buzzes throughout for iPads and laptops, and there’s big-screen Sky TV in the media room and table footie and pool in the games room. For readers, the shelves groan under the weight of books and there are piles of toys and DVDs to plunder. But maybe it’s the special privileges that resonate best. Feeling older than your years and staying up way beyond bedtime with the grown-ups. Playing whist or rummy with snacks long past midnight in front of the fire. Trying not to doze off during the family film. 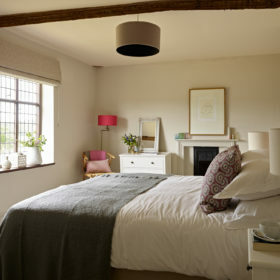 Do it all in cosy comfort at Orchard Farmhouse. 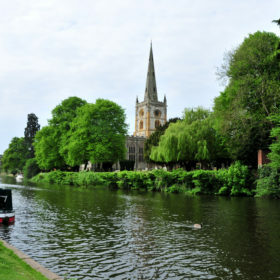 Hunt down some magic, myth and adventure at Warwick Castle, take a river tour through Stratford and top off your trip to the theatre with a bite in the rooftop restaurant. 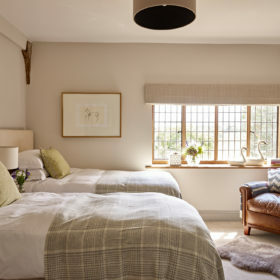 The Cotswolds is a short hop away for ancient limestone villages, rolling hills, gardens and gastro-pubs galore.